Meet-Me Conferences permit you to organize call-in meetings for larger groups. These conference sessions are scheduled in advance, on a one-time or recurring basis. Attendees phone in to your private conference telephone number and provide a conference ID code to enter. A Meet-Me Conference Extension must be added to your Halloo service plan in order to use this feature. 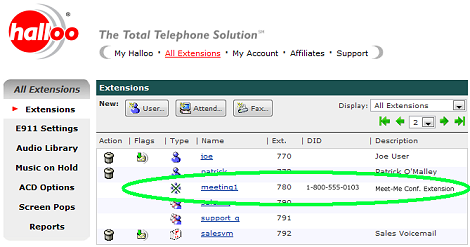 To schedule a conference call, click on the conference extension link (e.g. “meeting1” above) to enter the extension setup page. Here you will be able to set up new meetings as well as review future meetings. 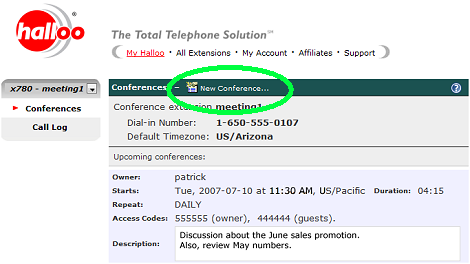 Click [New Conference…] to create a new conference call. A new window will appear for you to set up the meeting date, time, recurrence, etc. A random owner and guest code will be generated for the session. You may substitute your own codes here, but remember that like passwords, these codes help to prevent unauthorized use of your conference room.